Friday, Thanksgiving weekend ... and off we went to cut down our tree. It's so nice that we just have a short walk to find the perfect tree! This year, Landon measured from the floor to the ceiling. He took his tape measure and measured trees in the forest. 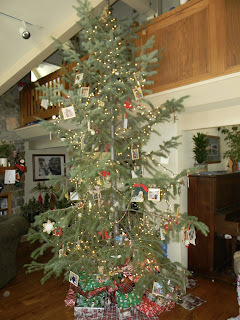 Decorating is always a bit chaotic, as the kids are super crazy wound up. But it's a fun day. And just like that, it feels like Christmas!